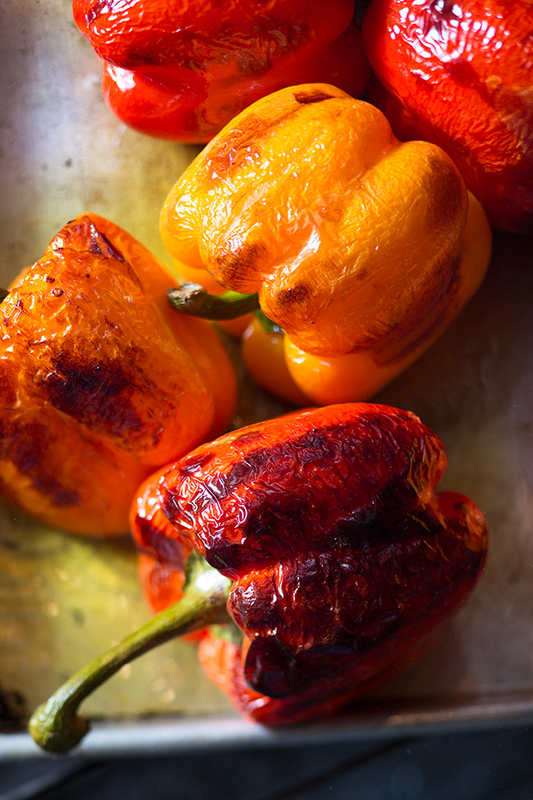 Roasting the Perfect Pepper - Grant Taylor Photography, Inc.
A pan of freshly-roasted peppers, just pulled from the oven, and still sizzling. Whoa! Lately, I’ve really been enjoying the process of creating imagery to illustrate a series of food-instructional articles for POST, a beautifully crafted, Rochester, NY – based magazine. Thus far, I’ve spent time photographing for four such articles, three of which have been published in successive issues of POST, with the next coming in the September / October issue, and more planned down the road. For the July / August issue of POST, I was teamed up again with the wonderful Sue Gardner Smith, who would be writing the article, and found that I’d be photographing executive chef, Jay Speranza, of Tony D’s, a deliciously fantastic, Italian eatery in Rochester’s Corn Hill neighborhood that features a menu of many beautiful things, many of which are prepared in the restaurant’s coal-fired oven. 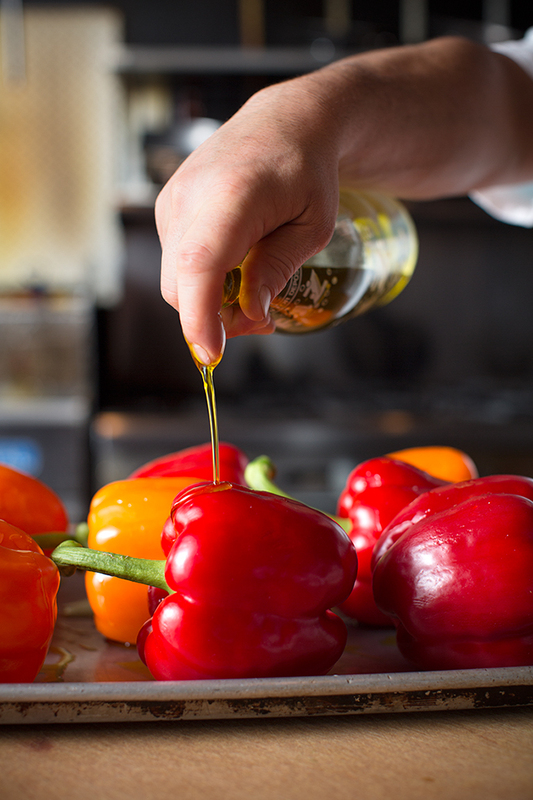 Step One – drizzling the olive oil on your arrangement of peppers. 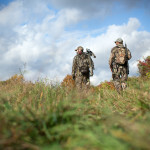 In coordinating our schedules, we landed on a Sunday morning photo-shoot, and I arrived at Tony D’s with a truck full of gear at 8:00 am. I met with Jay shortly thereafter, and he helped me to get oriented with the kitchen and the process of roasting the peppers. Jay had actually done a good bit of prep-work, and had roasted and prepared peppers already in a couple different ways, as I recall. We talked for a while about the steps in each process, and, settling on one method, how we might go through those steps to create some visually-interesting and storytelling images that are, for the purposes of instruction, also easily readable at the relatively smaller size in which they’d likely be reproduced. 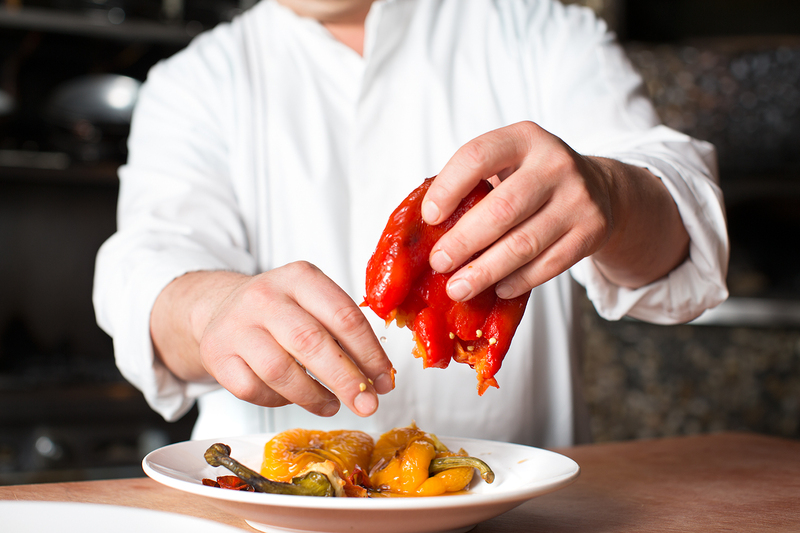 Transferring the peppers into a bowl, for a bit of a rest. I had decided upon the kitchen areas that I wished to photograph in, and while I was beginning to set up my lighting, Sue arrived. We had planned that she would sit with Jay for half-an-hour or so, and interview him, gathering the necessary materials for her article, while I worked on my lighting and got things ready for photography. The lighting for the entire series thus far had been pretty simple – one main light source (with some modifications,) and I wanted to try and stay consistent with that. I loved the quality and flexibility of the light setup I’d been working with – it renders the food with some gorgeous, rich texture and natural color, which I feel is so important and necessary to good food photography. I’ve also realized over the years that there’s also not typically a great deal of empty space in restaurant kitchens for setting up lighting gear – another reason to keep it simple! Still, I had brought out all the big guns, just in case. Never know what you might run into! 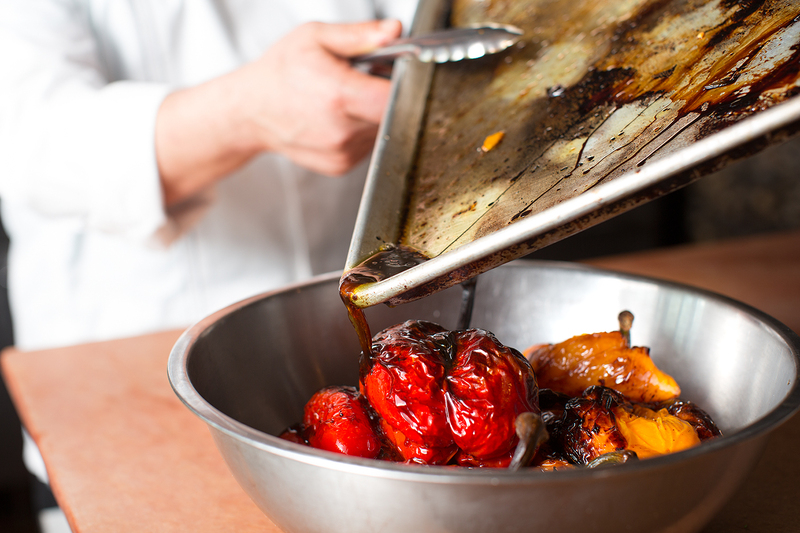 Re-drizzling the peppers with the juices rendered during their time in the oven. Once I was ready to go, I touched base with Sue, who was finishing up her interview with Jay. She had seemed very please with how it all had gone, and handed Jay over to me. Sue usually likes to stay for the photo-shoots, and I really enjoy her company when we’re able to work together – but on this day, she needed to run off to her responsibilities at Brighton Farmer’s Market instead. 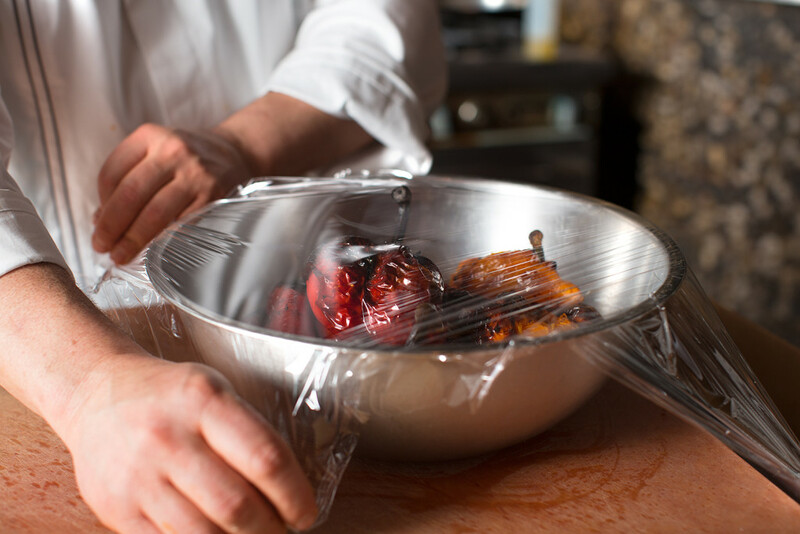 Covering the pepper bowl with a cling-wrap contains steam, and makes peeling easier! Well, Jay and I dove in and got to work. For the most part, we stayed with the chronological order of the steps involved with pepper roasting, but one or two steps were rearranged to allow us to work during the time the peppers were roasting in the oven. During the cooking time, Jay created some finished dishes with the peppers he had roasted already, and I photographed the three different recipes that he had made and plated up. 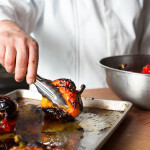 There was a stunning arrangement of roasted peppers, basil, roasted pine nuts and gorgonzola with a balsamic and olive oil drizzle, (whoa,) a coarsely processed roasted pepper coulis that he used to make some really incredible bruschetta. Finally, there was a mind-blowingly good sandwich that paired the roasted peppers with prime roast beef and a sharp provolone. Unbelievable. One of the very best sandwiches I’ve ever had. Ever. Jay, demonstrating seed removal from the just-skinned peppers. 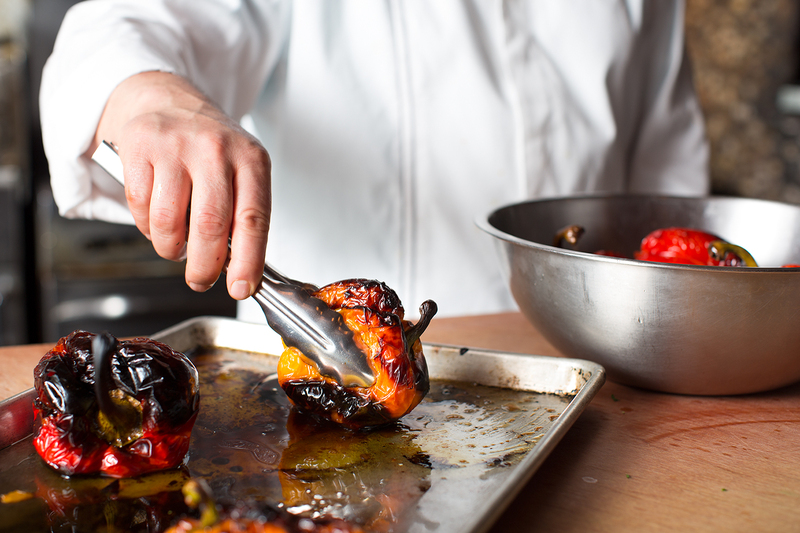 Once the finished dishes were all photographed, we got back on track with capturing the remaining steps of roasting the peppers, and finished up with what we needed to do there. The final step of the process was to spend some time creating a nice portrait of Jay to accompany the other images in the article. We had a really nice time visiting during the process, Jay’s father showed up and chatted with us for a while, and once I was satisfied that we’d done all that was needed, we wrapped, and I packed up the lighting and camera gear to head back home. 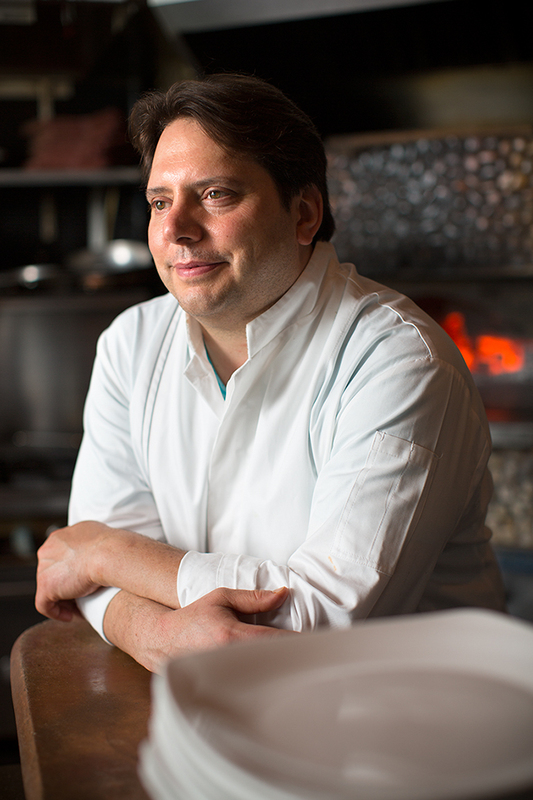 Jay Speranza, executive chef and culinary mastermind at Tony D’s, Rochester, New York. Photographed May 3, 2015. Jay, gracious as he is, sent me home with some of the delicious things he’d made for the day, all packaged up, that were shared and enjoyed with friends that evening! (Alright, alright. I need to come clean here, and be perfectly honest with you – I’m sorry!) See, prior to this shoot, I hadn’t really been much of a “lover of roasted peppers,” at least not most of the time. I don’t know, you get them in a sandwich somewhere at a nice café or something, and the peppers in the sandwich, well, they’re all cold and slimy – maybe they come from a jar, I have no idea. Blechhhhhh. No thank you! I usually choose to stay away from ’em! What I can tell you, though, is that during my time with Jay, and having been exposed to the beauty of wonderfully roasted and prepared peppers, I have been won over completely. I suppose, though, that being selective about where I enjoy my roasted peppers is the key – and I’m pretty certain that means another trip back to Tony D’s for some further exploration and research! Not a bad gig, in my estimation. The July / August issue of POST is currently on newsstands in the region, and is also available via subscription. For more information on how to pick up your own copy, just hit up the POST web site! 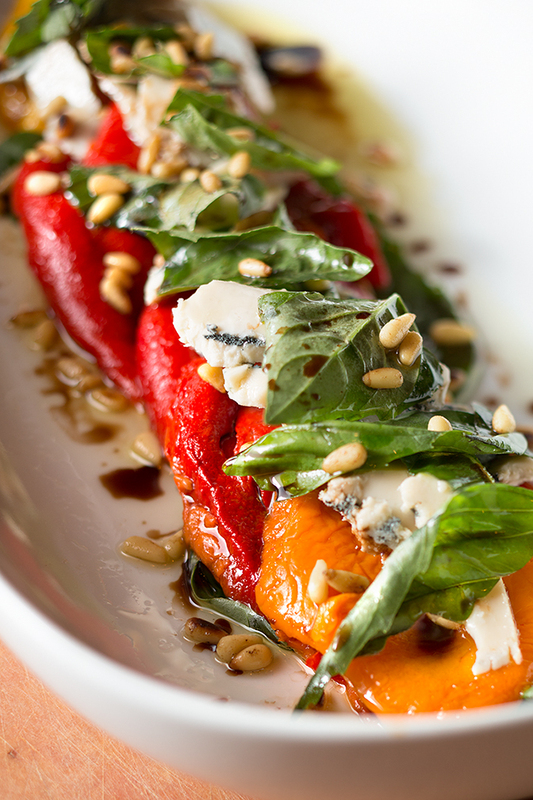 Roasted peppers and pine nuts with basil, an incredible gorgonzola, and balsamic / oil drizzle! Gorgeous!